They will marry properly as soon as he’s well, says Nina van Rooyen (26), from Table View. They will marry properly as soon as he’s well, says Nina van Rooyen (26), from Table View, Cape Town. “This gives him and me hope to cling to,” she says. 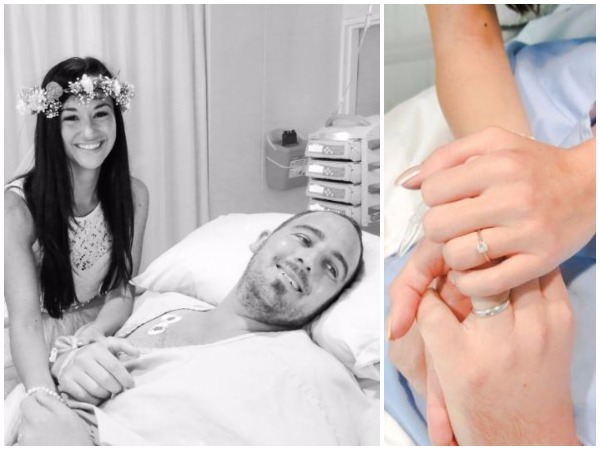 Jason Saunders – “the most humble, caring and loving person” – is fighting for his life after developing cancer of the brain and spine. “He sleeps most of the time and when he’s awake he sometimes hallucinates. He has no control over some of his bodily functions . . . It’s terrible to see him like this. He was fit and strong, an athlete,” Nina says, speaking from a clinic in Durbanville, near Cape Town. Jason and Nina have been together for three years. In October last year they bought a house together. “We were so looking forward to our life together,” Nina says. She and Jason met at the telecommunications company where they worked. But she resigned to take care of him and be with him as much as possible. In March he was diagnosed with a severe, aggressive, terminal form of brain cancer, glioblastoma multiforme stage four. An emergency operation was done and he had to have radiation- and chemotherapy. “The doctors gave him a few months to live,” Nina says. “They said his tumour was the most aggressive and fast-growing that they’d ever discovered. But an MRI scan in July showed that it had shrunk and he had to return only in October. “Things began to look better and we got engaged on 1 August. We planned to marry on 8 November, my birthday. The Bloubergstrand NG Church was booked for that date,” she says. But Jason began to complain of unbearable back pain, daily neck spasms and daily vomiting. When a scan was done last month it showed the cancer had spread to his spine and another operation and a series of radiation- and chemotherapy treatments were in store. “Cancer has taken away his ability to drive, surf, walk long distances and earn a salary. But it hasn’t quenched his fighting spirit, positivity, faith and perseverance,” Nina says. Jason’s medical aid is exhausted. He and Nina need more than R675 000 and have started a campaign on internet to raise the funds. So far just under 19 percent has been raised. “We know not everyone can donate money but we’re grateful that people are thinking of us at this time . . . We can’t wait to marry in church,” Nina says.